CLEARWATER SHUFFLEBOARD CLUB HAD THEIR ANNUAL DINNER AND WE ALL HAD A GREAT TIME. THE FOOD AND MUSIC WAS OUTSTANDING! 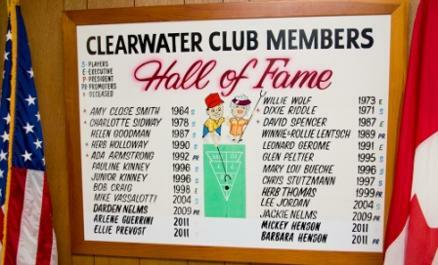 CSC President Kathy Brennan is also National Hall of Fame Curator located at Clearwater Shuffleboard Club. Susan Howe is awarded Certificate of Achiement from CSC Pres. Kathy Brennan. Susan has started Friday Night shuffling as well as recruiting new CSC members. Jim Schlie awarded Certificate of Achievement from CSC Pres. Kathy for outstanding workmanship keeping CSC's courts swept, beaded, disc waxed, etc. etc. CLEARWATER SHUFFLEBOARD CLUB HAD ANOTHER SPONSOR APPRECIATION DINNER THIS PAST MAR. 20TH, 2019 HELD AT JOHNNY'S ITALIAN. THESE DINNERS ARE FUN AND OPEN TO ALL CSC MEMBERS. 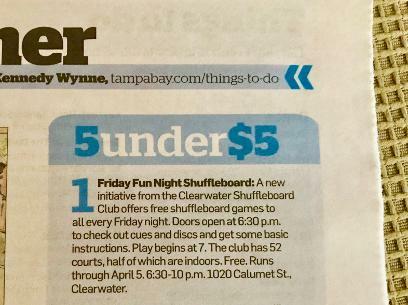 GO TO CLEARWATER SHUFFLEBOARD CLUB'S FACEBOOK PAGE. WE ENCOURAGE ALL INTERESTED TO VIEW AND POST ON IT! Below form is given to sponsors and hopefully they'll join the CSC team and help us via sponsorships! GOOD IDEA: Print the link form and take it to possible sponsors and ask them to become a CSC sponsor! Any business is a possibility from funeral homes to gas stations! 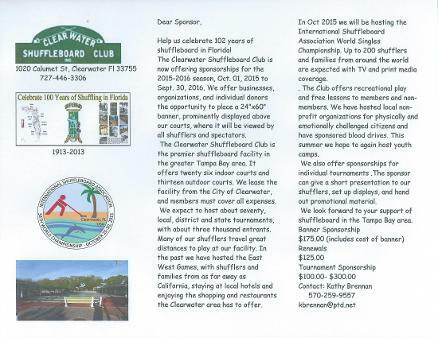 DID YOU KNOW EVERY NEW SPONSOR YOU SIGN-UP FOR CLEARWATER SHUFFLEBOARD CLUB PAYS YOU $30.00!!!! !